Comfort and convenience by design. Superior swimming experience by Hayward. The recommended salt level in pools is 3,000 ppm — less salt than in human tears. The ocean is 30,000 ppm, making a salt pool 1/10 the salinity and the salt barely detectable. As a natural, effective sanitization alternative to harsh chemical chlorine, salt chlorination is becoming an increasingly popular choice for pool and spa owners–with over 1 million units installed worldwide. to sanitize your pool and spa. As a natural, effective sanitization alternative to harsh chemical chlorine, salt chlorination is an increasingly popular choice for pool and spa owners around the world. 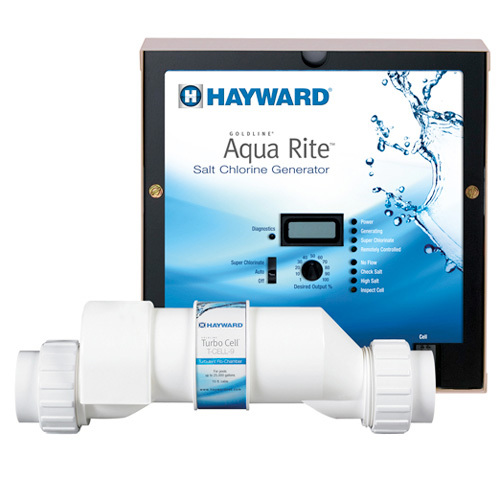 Hayward®’s patented salt-chlorination systems convert dissolved salt into just the right amount of chlorine, automatically creating perfectly sanitized, luxuriously soft water. Salt chlorination satisfies 100% of your pool and spa’s chlorination needs while providing three major advantages over traditional chlorination methods: comfort, convenience and cost savings. with the brand that does it best. More U.S. households have a Hayward salt chlorination system than any other two manufacturers combined. See why nearly 1 million households worldwide choose our salt systems to safely and naturally sanitize their pools. Comfort, convenience and cost savings—courtesy of the world’s #1 salt chlorinator. Hayward’s world-renowned AquaRite salt chlorination system provides a convenient alternative to conventional chlorine, automatically satisfying 100% of your pool’s sanitization needs, and creating the softest, silkiest water possible. With the industry’s best warranty support and cost savings of more than 50% over conventional chlorine, AquaRite will save you money for years to come. Add to that an independent certification from the National Sanitation Foundation (NSF), and it’s easy to see why this powerful system is #1 in the world. The world’s best-selling salt system—now with an exclusive advantage. 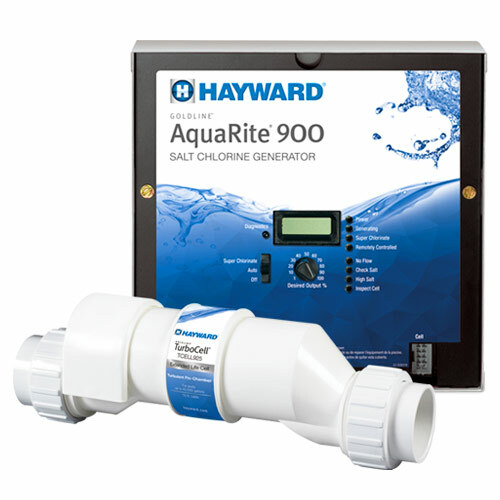 AquaRite 900 is designed to provide the same superior salt chlorination you expect from Hayward, but with an Extended Life TurboCell, it produces 25% more chlorine over its lifetime than our leading AquaRite systems. The Extended Life TurboCell cuts your annual chlorine costs by 50% or more, to less than $1 per pound. Plus, with an industry best 4-year warranty, you can relax in the comfort of your pool completely worry-free. AquaRite Pro is the integrated, professional-grade system that combines AquaRite salt chlorination with Sense and Dispense® chemistry automation. By automatically sensing and adjusting chlorine and pH levels, it creates perfectly balanced water with no measuring, testing or adjusting on your part. 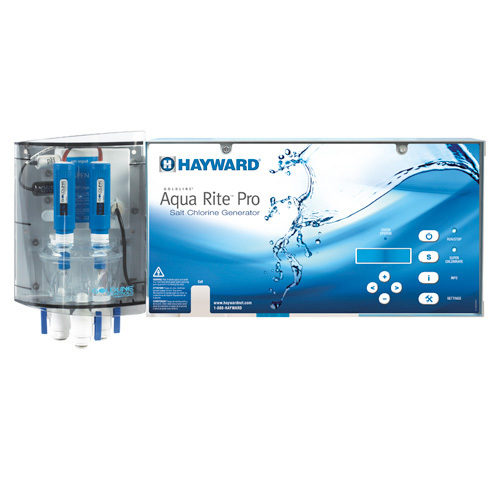 With AquaRite Pro, enjoy the most consistent water quality possible to minimize maintenance and maximize relaxation. 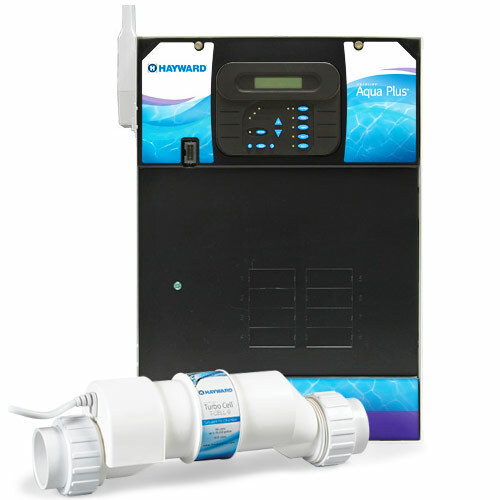 AquaPlus simplifies pool and spa ownership by bundling Hayward control capabilities and salt chlorination into one easy-to-order, easy-to-install package. Control any pool or spa function you like, and get the softest, silkiest water possible. Plus, when you integrate AquaPlus with AquaConnect Remote Pool Management, you can access any backyard function from anywhere in the world via your iPhone®, iPad® or Android device. Salt-chlorination systems automatically convert dissolved salt into a virtually endless supply of chlorine, so you can spend less time maintaining your pool and more time enjoying it. No more mixing and measuring harsh, factory produced liquid or tablet chlorine chemicals— just jump in and relax with total peace of mind. As a steady supply of 100% pure, natural chlorine continuously circulates throughout your pool, you can expect to cut your chlorine costs over the years by at least 50%. By keeping chlorine levels perfectly balanced, salt chlorination can also extend the life of your pool and spa, saving you expensive replacement costs down the road.